Background colours, gradients and images can be applied to all block HTML elements in the PDF, including the whole page, while inline HTML elements only support the background colour property. On block-level elements there’s good support for most image CSS properties which give you precise control over background images, image resolution, opacity and transparency. rgba(255, 255, 255, 1) – the last value is the alpha transparency and should be between 0-1.
hsla(360, 100%, 100%, 1) – the last value is the alpha transparency and should be between 0-1.
cmyka(100, 100, 100, 100, 1) – the last value is the alpha transparency and should be between 0-1.
spot(PANTONE 534, 100%, 85, 65, 47, 9) – defined as: name, tint, C, M, Y, K.
This is inline content <span style="background: yellow">that should be highlighted</span> and go and do this. 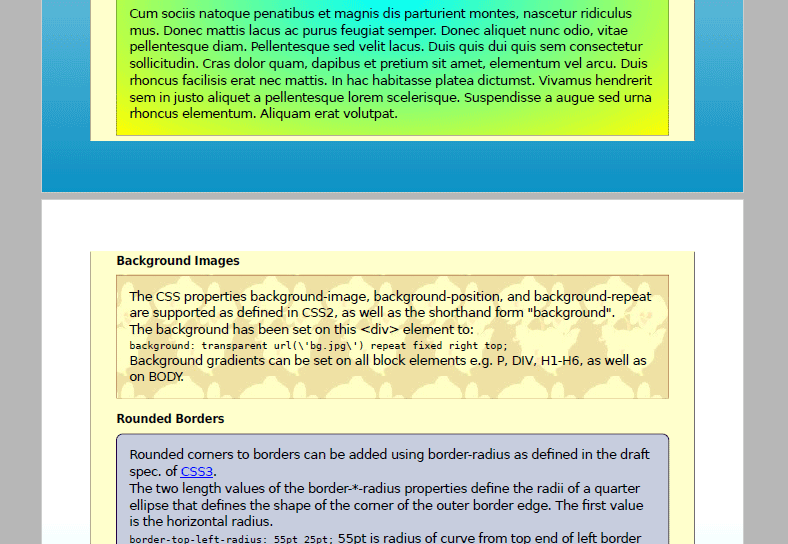 Both background linear and radial gradients are supported and can be applied using the background-image property, which follows the CSS3-specification. Most properties in this specification are supported, including: multiple colour-stops, opacity, gradient axis (linear) and shape and extent (radial). However some gradient line definitions like to right corner or to bottom left don’t work as expected – but right, left, or 45degs works correctly. Background images can be included using the URL or full local path – the preferred method using one of the absolute path constants – to the image. You can use the background or background-image, background-position, background-size and background-repeat CSS properties to control the image display. Currently unsupported is multiple background images per container. Finally, backgrounds can be applied to entire pages using the @page CSS selector. Download example PDF template file showing off backgrounds.